Harford County is a part of the Baltimore Metro area as well as the greater Baltimore/Washington Metropolitan region. Its charter form of government was formed in 1972 with the County seat located in Bell Air. There is a dramatic contrast in this region between the flatlands of the Atlantic coastal plain and the rolling hills of the Piedmont Plateau. There is also a harmonious blend of rural and suburban areas along Route 40; towns such as Bell Air and Aberdeen. Residents of Harford County of sine three percent increase in home values over the last 12 months. Future forecasts predict another two percent rise in the median price per square foot in the coming year. Harford County has experienced a lower percentage of foreclosures than the national average as well as the state average. Home sales have fluctuated dramatically in the last few years. 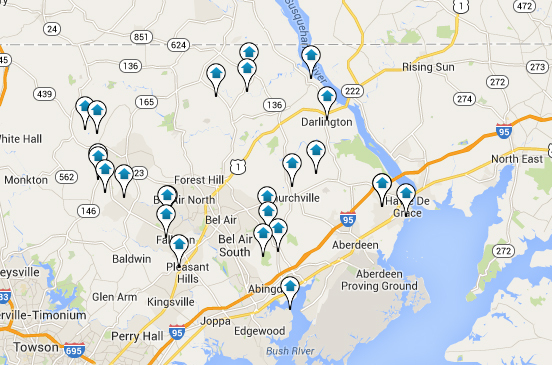 Overall, Harford County looks like a good opportunity for potential homebuyers in the area. Anyone looking for single-family homes situated in a rural or suburban setting would be wise to take a look in this region. Competitive prices, open floor plans and lots of room for growth makes Harford County an extremely attractive place to live.